Theres a conversation that occurs prior to the start of every hockey season between Kevin Sneddon and his team. The players state their goals for the upcoming season and the coach tells them what it will take to reach them. At the surface, it sounds like a corporate goal-setting session to kick off the new fiscal year  long on lip service, short on substance. But heres the hitch: Kevin Sneddon is serious  real serious. In fact, he will be there every trip down the ice to make sure his players dont veer from their stated goals and are giving maximum effort. If, for example, his players say they want to win Hockey East, arguably the nations toughest conference, in which the Cats will play for the first time this season, and post a team 3.0 grade point average, theyd better be prepared to put in as much work as Sneddon did in both areas as captain of a national championship team at Harvard in the early 1990s. Winning didnt come right away when Sneddon arrived two years ago from Union College. The Cats, who hadnt posted a winning season since 1996-97, were winless after Sneddon first 14 games. Despite his credentials as a successful college athlete and an impressive coaching run with non-scholarship players at Union, Sneddon still had some convincing to do at UVM. With his players feeling down and lacking confidence, Sneddon had to make a philosophical coaching decision that would set the tone for years to come. That strategy helped the team build to one of college hockeys most impressive turnarounds last season. The Cats went from winning just seven games in 2003-2004 to posting a 21-14-4 record in 2004-05. Sneddon says he took the job at UVM because he saw unlimited potential and a strong commitment from the administration. In the end, however, Sneddon knew his success would depend on the level of players he could bring to the campus. We feel like we have a good shot at some of the best players in the country, especially now that we had a decent season, says Sneddon. The challenge is that theres an elite group of recruits that tend to lean toward the really, really established programs. 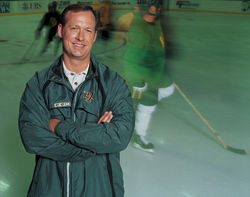 Weve got to go head-to-head with those programs and not be afraid to lose those battles. The coach adds that the change in conference promises to help UVM in recruiting, as Vermont assumes the rank of arguably the top academic school in Hockey East. With Sneddons third season rapidly approaching, its getting close to goal-setting time again. Captain Jaime Sifers says a trip to Boston for the Hockey East playoffs is definitely a priority and the teams commitment to Sneddons system is key to making it a possibility.